Bishop’s Move, the UK’s largest family owned removals company, is proud to announce that its entire branch network has become both ISO 14001 and BS OHSAS 18001 accredited. This is in recognition of the company’s environmentally friendly business credentials and high standard in its health and safety management systems and are in addition to Bishop’s Move’s existing IS0 9001 and BS8522 certifications. The accreditation in the internationally agreed ISO 14001 standard demonstrates that Bishop’s Move is focused on proactive environmental management; reducing costs, overheads and wastage, and achieving operational excellence by ensuring legislative awareness and compliance. Whilst the BS OHSAS 18001 acknowledges the company’s dedication to improving its day-to-day health and safety management, striving “towards zero accidents”. 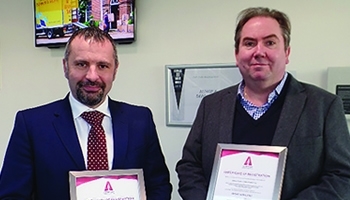 Bishop’s Move are Commercial Mover members of the British Association of Removers (BAR) and Commercial Moving Group (CMG), and these two new accreditations will help to underpin the Bishop’s Move Group’s reputation in for providing high-quality services to its business customers.